Onchocerciasis is an infection caused by the nematode Onchocerca volvulus. 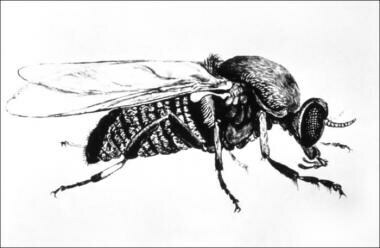 Humans acquire onchocerciasis through the bite of Simulium blackflies (see image below). [1, 2, 3] Because the fly develops and breeds in flowing water, onchocerciasis is commonly found along rivers and is sometimes referred to as river blindness. In the human host, the adult nematodes live in subcutaneous nodules and produce microfilariae, which are found throughout the body but preferentially reside in the skin and eye. 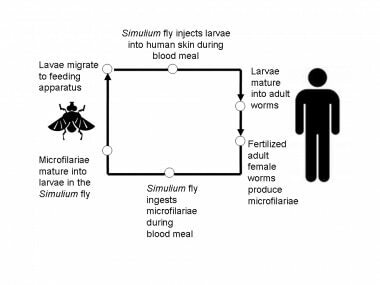 Repeated exposures to infected flies increase the number of adult worms and microfilariae in the host. Chronic cutaneous onchocerciasis (onchodermatitis) causes pruritus, a papular rash, scarring, and lichenification. Over time, affected skin may begin to sag, leading to terms such as "hanging groin." Patchy depigmentation on the legs leads to a condition known as leopard skin. The term sowda is used to describe severe pruritus with darkening of the skin, often confined to one limb. Chronic ocular onchocerciasis may lead to sclerosing keratitis and iridocyclitis, and finally to blindness. Subcutaneous nodule on hip caused by encysted Onchocerca volvulus. Simplified life cycle of Onchocerciasis volvulus. Onchocerciasis is not acquired in the United States. Occasional cases are found in immigrants or travelers from endemic areas. [8, 9] However, symptomatic onchocerciasis usually requires heavy infestations and repeated exposure to the vector fly. Short-term travelers are at little or no risk of the disease. Pruritus, dermatitis, and eosinophilia may occur in travelers who stay longer than 3 months in endemic areas of Africa. Symptoms may occur months to years after leaving the endemic area. Currently, onchocerciasis is endemic to 31 African countries, to Yemen, and in localized foci in Brazil and Venezuela. [10, 11] Globally, at least 18 million individuals have onchocerciasis, 99% of whom reside in Africa. [12, 13] The World Health Organization (WHO) estimates that 750,000 people are blind or have reduced vision as a result of the disease. Since 1975, the WHO, international foundations, nongovernmental organizations, and governments have worked cooperatively to reduce the burden of onchocerciasis. [14, 15, 16, 17, 18, 19, 20, 21, 22] Initial efforts focused on insecticide sprays and habitat control to reduce the numbers of black fly vectors. With the introduction of effective treatment, the program became focused on periodic treatment of at-risk persons. Long-term onchodermatitis may cause scarring, depigmentation, loss of skin elasticity, and disfigurement. Affected persons often have a low body mass. Blindness alone has been estimated to reduce life expectancy by 4-10 years. In the West African savanna, up to 10% of villagers may be blind from the disease. Onchocerciasis does not have a sexual predilection. Onchocerciasis does not have an age predilection. Children born to mothers with onchocerciasis may be immunotolerant to O volvulus infection, potentially leading to a higher microfilarial burden. Transplacental transmission of microfilariae may occur. Burnham G. Onchocerciasis. Lancet. 1998 May 2. 351(9112):1341-6. [Medline]. Hoerauf A, Büttner DW, Adjei O, Pearlman E. Onchocerciasis. BMJ. 2003 Jan 25. 326(7382):207-10. [Medline]. Udall DN. Recent updates on onchocerciasis: diagnosis and treatment. Clin Infect Dis. 2007 Jan 1. 44(1):53-60. [Medline]. Pion SD, Kamgno J, Demanga-Ngangue, Boussinesq M. Excess mortality associated with blindness in the onchocerciasis focus of the Mbam Valley, Cameroon. Ann Trop Med Parasitol. 2002 Mar. 96(2):181-9. [Medline]. Enk CD. Onchocerciasis--river blindness. Clin Dermatol. 2006 May-Jun. 24 (3):176-80. [Medline]. [Full Text]. Hoerauf A, Mand S, Volkmann L, Büttner M, Marfo-Debrekyei Y, Taylor M, et al. Doxycycline in the treatment of human onchocerciasis: Kinetics of Wolbachia endobacteria reduction and of inhibition of embryogenesis in female Onchocerca worms. Microbes Infect. 2003 Apr. 5(4):261-73. [Medline]. Hoerauf A, Specht S, Büttner M, Pfarr K, Mand S, Fimmers R, et al. Wolbachia endobacteria depletion by doxycycline as antifilarial therapy has macrofilaricidal activity in onchocerciasis: a randomized placebo-controlled study. Med Microbiol Immunol. 2008 Sep. 197(3):295-311. [Medline]. Klion AD. Filarial infections in travelers and immigrants. Curr Infect Dis Rep. 2008 Mar. 10(1):50-7. [Medline]. Nguyen JC, Murphy ME, Nutman TB, Neafie RC, Maturo S, Burke DS. 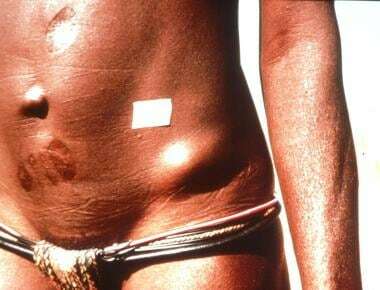 Cutaneous onchocerciasis in an American traveler. Int J Dermatol. 2005 Feb. 44(2):125-8. [Medline]. Richards F Jr, Rizzo N, Diaz Espinoza CE, Monroy ZM, Crovella Valdez CG, de Cabrera RM, et al. One Hundred Years After Its Discovery in Guatemala by Rodolfo Robles, Onchocerca volvulus Transmission Has Been Eliminated from the Central Endemic Zone. Am J Trop Med Hyg. 2015 Dec. 93 (6):1295-304. [Medline]. Onchocerciasis. WHO Media Center. Available at http://www.who.int/mediacentre/factsheets/fs374/en/. 01/2017; Accessed: 4/25/2017. Richards F Jr, Rizzo N, Diaz Espinoza CE, Morales Monroy Z, Crovella Valdez CG, de Cabrera RM, et al. One Hundred Years After Its Discovery in Guatemala by Rodolfo Robles, Onchocerca volvulus Transmission Has Been Eliminated from the Central Endemic Zone. Am J Trop Med Hyg. 2015 Oct 26. [Medline]. Vlaminck J, Fischer PU, Weil GJ. Diagnostic Tools for Onchocerciasis Elimination Programs. Trends Parasitol. 2015 Oct 9. [Medline]. World Health Organization. Onchocerciasis (river blindness). Wkly Epidemiol Rec. 2001 Jul 6. 76(27):205-10. [Medline]. World Health Organization. Onchocerciasis and its control. Report of a WHO Expert Committee on Onchocerciasis Control. World Health Organ Tech Rep Ser. 1995. 852:1-104. [Medline]. World Health Organization. Onchocerciasis (river blindness). Report from the Fourteenth InterAmerican Conference on Onchocerciasis, Atlanta, Georgia, United States. Wkly Epidemiol Rec. 2005 Jul 29. 80(30):257-60. [Medline]. Dimomfu BL, Lubeji DK, Noma M, Sékétéli A, Boussinesq M. African Programme for Onchocerciasis Control (APOC): sociological study in three foci of central Africa before the implementation of treatments with ivermectin (Mectizan). Trans R Soc Trop Med Hyg. 2007 Jul. 101(7):674-9. [Medline]. Hotez PJ. Control of onchocerciasis--the next generation. Lancet. 2007 Jun 16. 369(9578):1979-80. [Medline]. Sauerbrey M. The Onchocerciasis Elimination Program for the Americas (OEPA). Ann Trop Med Parasitol. 2008 Sep. 102 Suppl 1:25-9. [Medline]. Amazigo U. The African Programme for Onchocerciasis Control (APOC). Ann Trop Med Parasitol. 2008 Sep. 102 Suppl 1:19-22. [Medline]. Boatin B. The Onchocerciasis Control Programme in West Africa (OCP). Ann Trop Med Parasitol. 2008 Sep. 102 Suppl 1:13-7. [Medline]. Krotneva SP, Coffeng LE, Noma M, Zouré HG, Bakoné L, Amazigo UV, et al. African Program for Onchocerciasis Control 1995-2010: Impact of Annual Ivermectin Mass Treatment on Off-Target Infectious Diseases. PLoS Negl Trop Dis. 2015 Sep. 9 (9):e0004051. [Medline]. Progress towards eliminating onchocerciasis in the WHO Region of the Americas: verification of elimination of transmission in Guatemala. Wkly Epidemiol Rec. 2016 Oct 28. 91 (43):501-5. [Medline]. Enk CD. Onchocerciasis--river blindness. Clin Dermatol. 2006 May-Jun. 24(3):176-80. [Medline]. Kayembe DL, Kasonga DL, Kayembe PK, Mwanza JC, Boussinesq M. Profile of eye lesions and vision loss: a cross-sectional study in Lusambo, a forest-savanna area hyperendemic for onchocerciasis in the Democratic Republic of Congo. Trop Med Int Health. 2003 Jan. 8(1):83-9. [Medline]. Timmann C, van der Kamp E, Kleensang A, König IR, Thye T, Büttner DW, et al. Human genetic resistance to Onchocerca volvulus: evidence for linkage to chromosome 2p from an autosome-wide scan. J Infect Dis. 2008 Aug 1. 198(3):427-33. [Medline]. Colebunders R, Hendy A, van Oijen M. Nodding Syndrome in Onchocerciasis Endemic Areas. Trends Parasitol. 2016 Aug. 32 (8):581-3. [Medline]. Lipner EM, Dembele N, Souleymane S, Alley WS, Prevots DR, Toe L, et al. Field applicability of a rapid-format anti-Ov-16 antibody test for the assessment of onchocerciasis control measures in regions of endemicity. J Infect Dis. 2006 Jul 15. 194(2):216-21. [Medline]. Weil GJ, Steel C, Liftis F, Li BW, Mearns G, Lobos E. A rapid-format antibody card test for diagnosis of onchocerciasis. J Infect Dis. 2000 Dec. 182(6):1796-9. [Medline]. Nde PN, Pogonka T, Bradley JE, Titanji VP, Lucius R. Sensitive and specific serodiagnosis of onchocerciasis with recombinant hybrid proteins. Am J Trop Med Hyg. 2002 May. 66(5):566-71. [Medline]. Rodríguez-Pérez MA, Domínguez-Vázquez A, Méndez-Galván J, Sifuentes-Rincón AM, Larralde-Corona P, Barrera-Saldaña HA, et al. Antibody detection tests for Onchocerca volvulus: comparison of the sensitivity of a cocktail of recombinant antigens used in the indirect enzyme-linked immunosorbent assay with a rapid-format antibody card test. Trans R Soc Trop Med Hyg. 2003 Sep-Oct. 97(5):539-41. [Medline]. Guzmán GE, Lavebratt C, Luján R, Akuffo H. Diagnosis of onchocerciasis using highly specific and sensitive native proteins. Scand J Infect Dis. 2002. 34(8):583-90. [Medline]. Ayong LS, Tume CB, Wembe FE, Simo G, Asonganyi T, Lando G. Development and evaluation of an antigen detection dipstick assay for the diagnosis of human onchocerciasis. Trop Med Int Health. 2005 Mar. 10(3):228-33. [Medline]. Boatin BA, Toé L, Alley ES, Dembélé N, Weiss N, Dadzie KY. Diagnostics in onchocerciasis: future challenges. Ann Trop Med Parasitol. 1998 Apr. 92 Suppl 1:S41-5. [Medline]. Ozoh G, Boussinesq M, Bissek AC, Kobangue L, Kombila M, Mbina JR, et al. Evaluation of the diethylcarbamazine patch to evaluate onchocerciasis endemicity in Central Africa. Trop Med Int Health. 2007 Jan. 12(1):123-9. [Medline]. Toè L, Adjami AG, Boatin BA, Back C, Alley ES, Dembélé N. Topical application of diethylcarbamazine to detect onchocerciasis recrudescence in west Africa. Trans R Soc Trop Med Hyg. 2000 Sep-Oct. 94(5):519-25. [Medline]. Guderian RH. Effects of nodulectomy in onchocerciasis in Ecuador. Trop Med Parasitol. 1988 Dec. 39 Suppl 4:356-7. [Medline]. Kale, O. O. "Controlled studies on the effect of nodulectomy on the concentration of microfilariae in the skin of patients exposed o continuing transmission of Onchocerca volvulus in the rain-forest zone of Western Nigeria.". Tropenmedizin und Parasitologie. 1982. 40-42. Basáñez MG, Pion SD, Boakes E, Filipe JA, Churcher TS, Boussinesq M. Effect of single-dose ivermectin on Onchocerca volvulus: a systematic review and meta-analysis. Lancet Infect Dis. 2008 May. 8(5):310-22. [Medline]. Reddy M, Gill SS, Kalkar SR, Wu W, Anderson PJ, Rochon PA. Oral drug therapy for multiple neglected tropical diseases: a systematic review. JAMA. 2007 Oct 24. 298(16):1911-24. [Medline]. Gutman J, Emukah E, Okpala N, Okoro C, Obasi A, Miri ES. Effects of annual mass treatment with ivermectin for onchocerciasis on the prevalence of intestinal helminths. Am J Trop Med Hyg. 2010 Sep. 83(3):534-41. [Medline]. Hoerauf A, Mand S, Adjei O, Fleischer B, Büttner DW. Depletion of wolbachia endobacteria in Onchocerca volvulus by doxycycline and microfilaridermia after ivermectin treatment. Lancet. 2001 May 5. 357(9266):1415-6. [Medline]. Taylor MJ, Hoerauf A, Townson S, Slatko BE, Ward SA. Anti-Wolbachia drug discovery and development: safe macrofilaricides for onchocerciasis and lymphatic filariasis. Parasitology. 2014 Jan. 141 (1):119-27. [Medline]. Linehan M, Hanson C, Weaver A, et al. Integrated implementation of programs targeting neglected tropical diseases through preventive chemotherapy: proving the feasibility at national scale. Am J Trop Med Hyg. 2011 Jan. 84(1):5-14. [Medline]. Turner JD, Tendongfor N, Esum M, et al. Macrofilaricidal activity after doxycycline only treatment of Onchocerca volvulus in an area of Loa loa co-endemicity: a randomized controlled trial. PLoS Negl Trop Dis. 2010 Apr 13. 4(4):e660. [Medline]. [Full Text]. Klarmann-Schulz U, Specht S, Debrah AY, Batsa L, Ayisi-Boateng NK, Osei-Mensah J, et al. Comparison of Doxycycline, Minocycline, Doxycycline plus Albendazole and Albendazole Alone in Their Efficacy against Onchocerciasis in a Randomized, Open-Label, Pilot Trial. PLoS Negl Trop Dis. 2017 Jan. 11 (1):e0005156. [Medline]. Siva N. WHO researchers start trial on a new drug for river blindness. BMJ. 2009. 339:b2755. [Medline]. Opoku NO, Bakajika DK, Kanza EM, Howard H, Mambandu GL, Nyathirombo A, et al. Single dose moxidectin versus ivermectin for Onchocerca volvulus infection in Ghana, Liberia, and the Democratic Republic of the Congo: a randomised, controlled, double-blind phase 3 trial. Lancet. 2018 Jan 17. [Medline]. [Full Text]. Specht S, Mand S, Marfo-Debrekyei Y, Debrah AY, Konadu P, Adjei O, et al. Efficacy of 2- and 4-week rifampicin treatment on the Wolbachia of Onchocerca volvulus. Parasitol Res. 2008 Nov. 103(6):1303-9. [Medline]. Hoerauf A, Marfo-Debrekyei Y, Büttner M, Debrah AY, Konadu P, Mand S, et al. Effects of 6-week azithromycin treatment on the Wolbachia endobacteria of Onchocerca volvulus. Parasitol Res. 2008 Jul. 103(2):279-86. [Medline]. Bah GS, Ward EL, Srivastava A, Trees AJ, Tanya VN, Makepeace BL. Efficacy of three-week oxytetracycline or rifampicin monotherapy compared with a combination regimen against the filarial nematode Onchocerca ochengi. Antimicrob Agents Chemother. 2013 Nov 18. [Medline]. World Health Organization. Guidelines for Stopping Mass Drug Administration and Verifying Elimination of Human Onchocerciasis. 2016. [Medline]. [Full Text]. Report from the 2009 Inter-American Conference on Onchocerciasis: progress towards eliminating river blindness in the Region of the Americas. Wkly Epidemiol Rec. 2010 Aug 13. 85(33):321-6. [Medline]. Schneider MC, Aguilera XP, Barbosa da Silva Junior J, et al. Elimination of neglected diseases in latin america and the Caribbean: a mapping of selected diseases. PLoS Negl Trop Dis. 2011 Feb 15. 5(2):e964. [Medline]. [Full Text]. Histopathology of an Onchocerca volvulus nodule. Courtesy of the CDC and Dr. Mae Melvin. Man blinded by microfilariae of Onchocerca volvulus. Bleeding on skin due to scratching of itchy skin (onchodermatitis). One anatomic quarter of body (leg) markedly affected by edema and papule formation of onchodermatitis. Skin of a West African person with leopard spot depigmentation. Patient from Cameroon with sowdalike lesions. Microfilaria of Onchocera volvulus stained from skin biopsy. Courtesy of Cali Colombia, D Scott Smith, MD, and Gloria Palma, MD, PhD. Taking a skin snip from the hip with a 5-microgram iris scissors for quantitatively diagnosing Onchocerca volvulus infection (Rio de Micay, Colombia). Courtesy of D Scott Smith, MD. Adults blinded by onchocerciasis. This is the WHO/New York Times photo that inspired World Bank funding for River Blindness control programs and then the bronze statue in front of the WHO in Geneva Switzerland. Courtesy of Otis Historical Archives, National Museum of Health and Medicine.